Your new favourite funk, soul and R&B band! The Midnight Funk Orchestra are a spectacular live band, able to keep you dancing all night to our infectious mixture of funk, soul, pop and R&B songs. The band will set the right tone for a sophisticated wedding, party or other function and provide fantastic entertainment to thrill people of all ages. Young, talented and in-demand musicians and singers, many of the band boast first-class music degrees, session work for major artists and record labels, performances in iconic venues such as the Royal Albert Hall, Koko, the Shepherd’s Bush Empire and Ronnie Scott’s Jazz Club, and appearances in West End shows and on Jazz FM, BBC Radio 2 and Later with Jools Holland. The band have many years’ experience of playing for weddings, corporate events, university balls, fundraising events, anniversaries, birthdays, Christmas and New Year’s Eve parties and other occasions and functions in clubs, bars, restaurants, hotels, marquees, stately homes and community spaces throughout the UK and Europe. 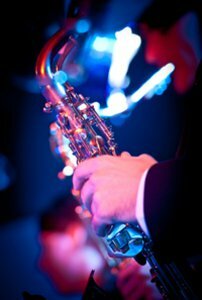 As well as providing the main band to get everyone dancing, the Midnight Funk Orchestra can also provide sublime jazz or classical music for earlier stages of your event – see our line-ups and packages page for further details. Check out our repertoire and how we can make your event extra special, and then contact us to book the Midnight Funk Orchestra!